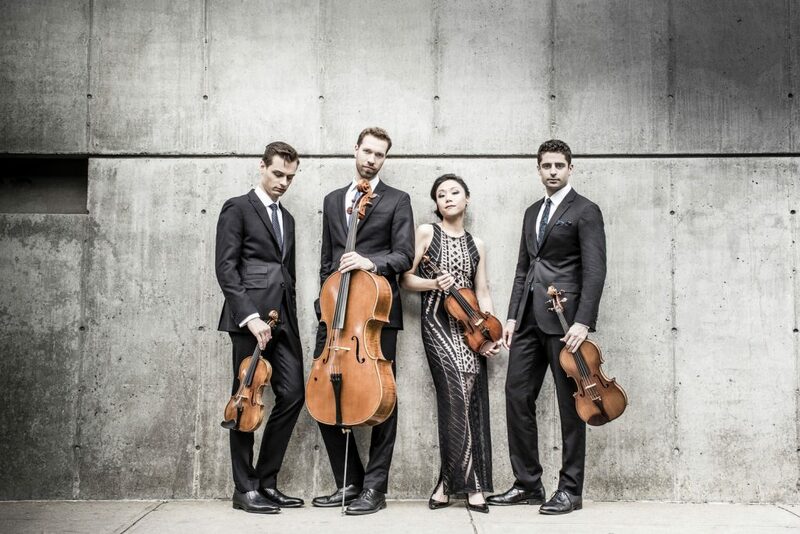 The procession of string quartets to South County concert venues continued last Tuesday with a concert by the Tesla String Quartet. They chose a classic program: Bartók’s Third Quartet of 1927 was flanked by early and middle period quartets of Beethoven. Founded at New York’s Juilliard School in 2008, the Teslas quickly began to attract awards, including both Banff and Fischoff. Last summer, they received the John Lad Prize at Stanford University, which carries with it an appearance on the Stanford Live series. They are currently artists-in-residence in Hickory, N.C., and recently completed their first CD, to be released soon. Their name comes from the Serbian inventor Nikola Tesla, specifically his observation that “we are held together, like the stars in the firmament, with ties inseparable,” which ties are understood to be music. They were well placed on the floor of the Flagler’s Music Room. The ensemble sound was achieved on these instruments: First violin Ross Snyder’s was made in 1937 by the Canadian luthier Joseph Rashid on loan from the Joseph Rashid Foundation; second violin Michelle Lie played an early 18th-century instrument of unknown origin, likely French, with a doubtful attribution to Giovanni Grancino in 1698. Edwin Kaplan’s viola was made for him in 2006 by the New York-based luthier Andrius J. Faruolo; Serafim Smigelskiy played a cello made in China in 2016 by Yan-Bing Chen. Regardless of their pedigrees, or lack of them, the instruments combined to produce a suave collective sonority that not only was well-focused for the audience but also resounded through the room’s reverberant surroundings, without obscuring the musical textures. Beethoven’s Quartet in No. 2 (in G, Op. 18, No. 2) opened the program. Of the six quartets in the set Beethoven published in 1801, it may be the earliest. It certainly is suffused with the spirit of the 18th century. Even the scherzo, Beethoven’s innovation in the genre, is more well-mannered than in the other five. Sometimes known in Europe as the Compliments Quartet, its four movements were played with suitable lyricism and vigor according to the progress of the music. Béla Bartók’s Third String Quartet (Sz. 85) has been alternately thrilling and annoying listeners since its London premiere in 1929. It is a ferociously concentrated musical statement, a single movement comprised of two parts, with little about it that seems conventionally beautiful. Its strong dissonance and rhythmic outbursts have an intense energy heralding an entirely new way of listening (pioneered in the orchestra by Stravinsky). On the other hand, the work is a riot of color, calling for such bowing effects as col legno (playing the string with the stick of the bow), sul ponticello (playing near the bridge), martellato (short “hammered” strokes), and others. Bartók also asks often for the players to bow con tutta la lunghezza dell’arco (full bow strokes on single notes or short phrases) and powerful upward and downward glissandi that sound like portamento gone mad. The Tesla made it the centerpiece of the program, performing with brilliant virtuosity and never a false step from first note to last. Their residency with the Takács Quartet from 2009-12 was obviously well-spent. After intermission, I noticed some empty seats that earlier were occupied, a mute testament to the Bartók Third’s power to unsettle audiences for almost 90 years. Beethoven’s Quartet No. 10 (in E-flat, Op. 74) was the concluding work. In 1809, Beethoven’s life was troubled, but the amiable mien of this quartet does not suggest it. It does contain an innovation that led later in the century to its nickname of “Harp,” namely, a series of pizzicati heard throughout the opening Allegro. They sound nothing at all like a harp, and might seem more like a guitar to some, but the name has stuck. Beethoven may not have been the first to mark pizzicati in a string quartet but the effect was as startling at the premiere in 1811 as the bowing techniques called for by Bartók in his Third Quartet. The other innovations in this work are in its final two movements, which demand a high level of technical skill. The scherzo third movement is in fact an enlarged Presto, another example of Beethoven’s expansion of form, and a finale that begins Allegretto con variazioni ends in a furious Allegro. Despite a good account of the first two movements, I felt that the Presto was often played too fast to permit clean articulation. Passages marked Più presto quasi prestissimo became a blur in which the dotted half-note motive did not have its proper value. Similarly, the variations theme of the finale was played with little regard for its innate humor, and, later, at un poco più vivace, the articulation between eighth notes and triplet eighths was muddy and lacked delicacy.